Being originally from Europe, there was the one and the only Doberman type that I knew – a strong athletic dog, with exceptional loyalty to his master, and superior protection ability. After moving to the US, I was surprised to learn that there is a difference between American vs European Doberman. Back in the days in Europe, if you wanted a purebred puppy, you would go to the conformation shows and get acquainted with breeders. You might have to be on the waiting list (sometimes a couple of years) to get a puppy from a well known breeder. The puppy you get would have a great potential in a show ring, will be a dedicated family companion, and unquestionably will be an excellent guard dog. You get a purebred dog with potential, and it is up to you to develop its talents. I took the known to me route when I began searching for a Doberman puppy in the US. I went to the American Kennel Club (AKC) breeder directory and attended a couple of AKC shows. The dogs I saw there looked a bit differently than what I remembered, but I proceeded with contacting breeders. What tipped me off was a question that all US breeders were asking me: “do you want a pet or a show dog?”. Having owned Dobermans in Europe, my answer is “I want a doberman – a friend, companion, a show dog, a sport dog, a guard”. I wanted to participate in shows with my dog and compete in IPO (Schutzhund) – a very competitive protection sport for dogs. Breeders that I’ve contacted seemed confused as if I was asking for a unicorn. So, I began digging deeper into the question and learning about American vs European Doberman types. Before you continue reading I want to make clear that this article is not about breeders and not about picking sides. This article is contribution to pet owners education, to provide missing (or hardly available) piece of information about the breed, and to help potential doberman owners make the right choice. While many AKC-type of a breeder will argue with me that American Doberman has the same breed standard as European Doberman, there is no doubt the difference exists. The FCI (European) standard description has 7.5 pages and a drawing of proportions of the dog. The AKC (American) standard is described in 1.5 pages. Without going into any details, that should summarize it for you: the American Doberman, just like the AKC breed description, is an edited version of a European Doberman – in shape, in temperament, and in its original qualities. You can find breed standard descriptions on the AKC (American Kennel Club) and IDC (International Doberman Club in Germany) websites. Click on the links, then scroll down and click on “breed standard”. Let’s look at a few excerpts from these standards. There are some discrepancy and some similarity in the wording of both standards. Let’s take a look how these standards are represented. Below are 2 videos I found on Youtube to demonstrate both – European and American – doberman conformation shows. In the video below you can see European Doberman males and females in a show ring stacked and moving. In the next video below you can see American Doberman males competing for Best of Breed title. NOTE: I do not know and do not promote any dogs or breeders shown in these videos. These videos were randomly selected because of their decent quality. I also want to point out the front feet in the American Dobermans video. The AKC standard dictates: “Forequarters: legs seen from front and side, perfectly straight and parallel to each other … feet … turning neither in nor out”. Take a closer look at the feet of the dogs in this video. Do they comply with the standard? The biggest difference between American vs European doberman is in the temperament. And not in the way it is worded in the standards, but in simple lack of drive and working ability in the American Doberman. 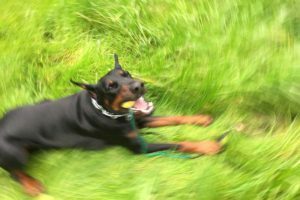 While AKC standard describes doberman as “fearful and alert”, many AKC dobermans can’t pass a simple temperament test, shy (or even scared) of noises and unfamiliar surfaces. Another deviation from their own standard? 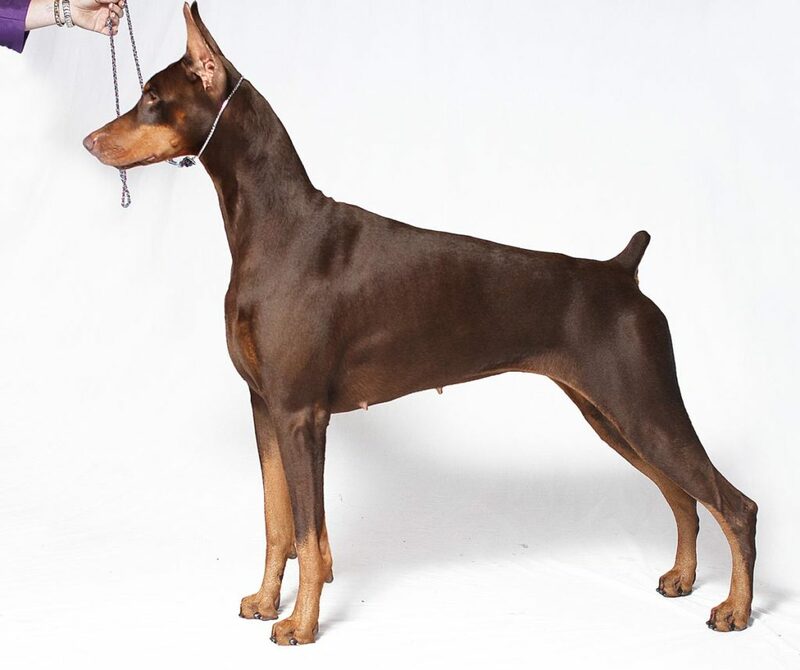 And the most important – AKC dobermans are not suitable for protection work and sport. Many of them, besides lack of protection drive, also lack of physical characteristics, necessary for an impactful bite. Long necks, light bone structure, and lack of chin bone (under the chin) makes it impossible for a dog to sustain a powerful attack and full bite on a decoy. 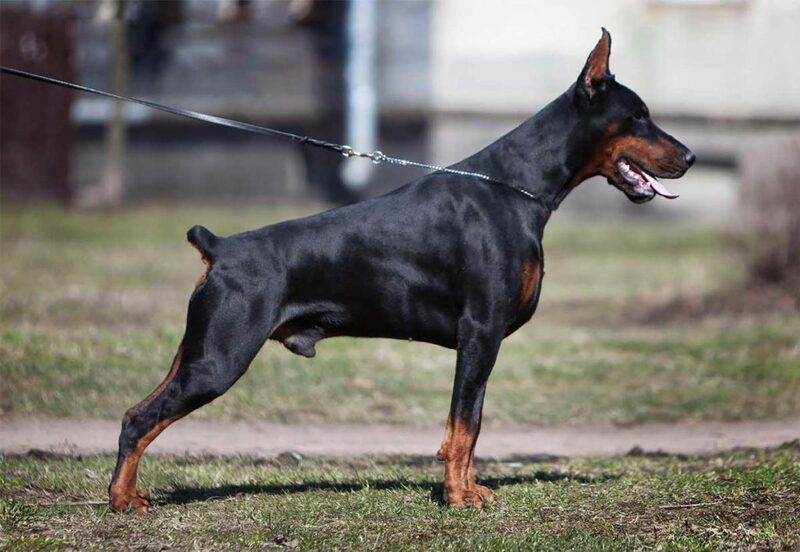 You can contact any AKC doberman breeder and ask for a puppy contract that guarantees that the dog will be suitable to perform in IPO/Schutzhund or any other bite sport. See what happens. When I brought my imported Doberman puppy to his first protection training at the Schutzhund club, people were laughing at me – “dobermans are no good for Schutzhund. They have no drive” – I was told. As my dog was growing up and we were visiting different Schutzhund clubs in the area – the welcome was always the same “what are you doing with a doberman on the Schutzhund field?”. And as some people might think I am prejudice against American Dobermans, it is not me, who destroyed Doberman’s reputation in the US as a working dog. My dog is older now, and no one makes jokes about his protection work any more. He demonstrates abundance of confidence, plenty of drive, and doesn’t full around when it comes to protection. He earned a High IPO3 Doberman title at the US National competition. And as a mentally well-balanced European Doberman, he is super friendly to people and other dogs. We go to home improvement stores and crowded shopping malls where he walks confidently and proudly by my side. The reason why American Dobermans lost their working ability is partially consumer driven, partially regulations driven. Or the lack of the latter. In Europe, dogs are not allowed for breeding if they don’t pass a working test. The test is called ZTP (you can find the ZTP regulations on mentioned above IDC website). This test is designed to test a dog’s mental stability, social skills, nerves, and working performance. During the test a dog is required to walk through the crowd of noisy strangers, identify friendly from suspicious people, remain calm during the gun shot, and to protect his master during attempted attack (the dog is actually required to attack and bite a decoy). In addition – the dog is measured, his teeth are counted, and overall conformation is checked to ensure that the dog is also within the required breed standard. The dog is given a rating for protection performance and for conformation. It is listed on a dog’s pedigree (i.e. ZTP – V1A, or ZTP – V1B, etc.). I think a dog is allowed to take this test only once in a lifetime, but i think it varies by breed. Many European doberman clubs have breeding regulations and guidelines that are strictly reinforced. Litters that were bred in conflict with regulations do not get registered and won’t have FCI pedigree. And here is how you can register a litter in the US. An online litter registration form on the AKC website: “A litter is eligible for AKC Registration if the puppies were born (whelped) in the USA from an AKC-registered female (dam) that was mated to an AKC-registered male (sire) of the same breed. 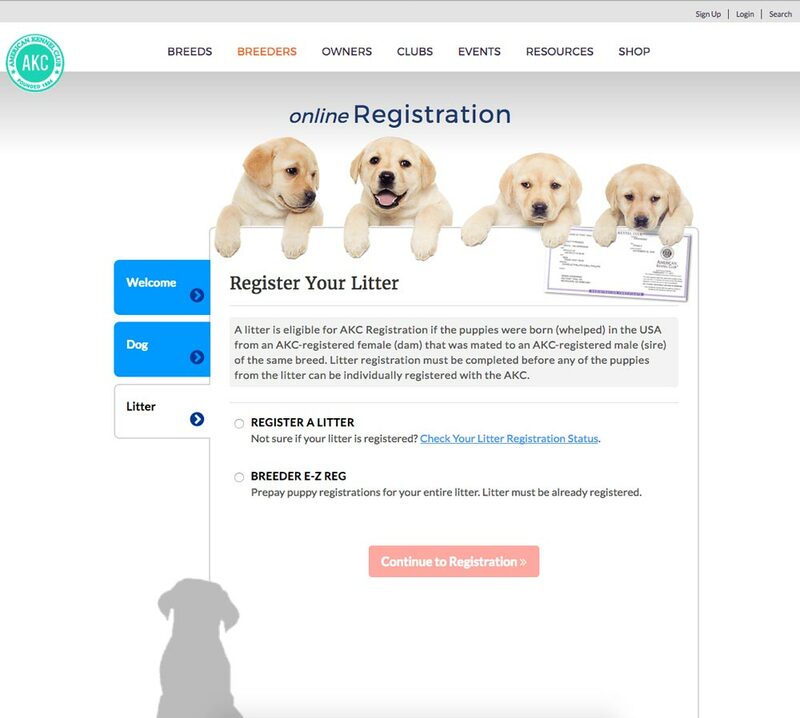 Litter registration must be completed before any of the puppies from the litter can be individually registered with the AKC.” AKC doesn’t regulate breeding. They provide “education”, but don’t reinforce any rules. And that is how Europeans were able to preserve the Doberman as a mentally stable and working dog, and Americans deviated into its own niche for US consumers. While focusing on consumer, AKC breeders tried to produce easier to manage Doberman, suitable for broader, less experienced audience. Unfortunately, by selecting dogs with less drive for their breeding it is inevitably altered the breed in other areas – mental stability, working ability, health. In fact, many of the American type of dobermans can’t pass a simple social test, get anxious and nervous in new places, afraid of noise and gun shots. And there is something else to consider. European breeders have no interest in American dogs for their breeding. While American breeders gladly mix European lines in to improve their bloodlines with desired color markings, bone structure, and, of course, temperament. The same difference between American vs European dogs apply to most working breeds – German Shepherds, Rottweilers, Boxers. Most dogs that participate in Schutzhund/IPO sport are imported from Europe or of European bloodlines. Most dogs that work in US law enforcement (even in CIA) – are imported from Europe, too! 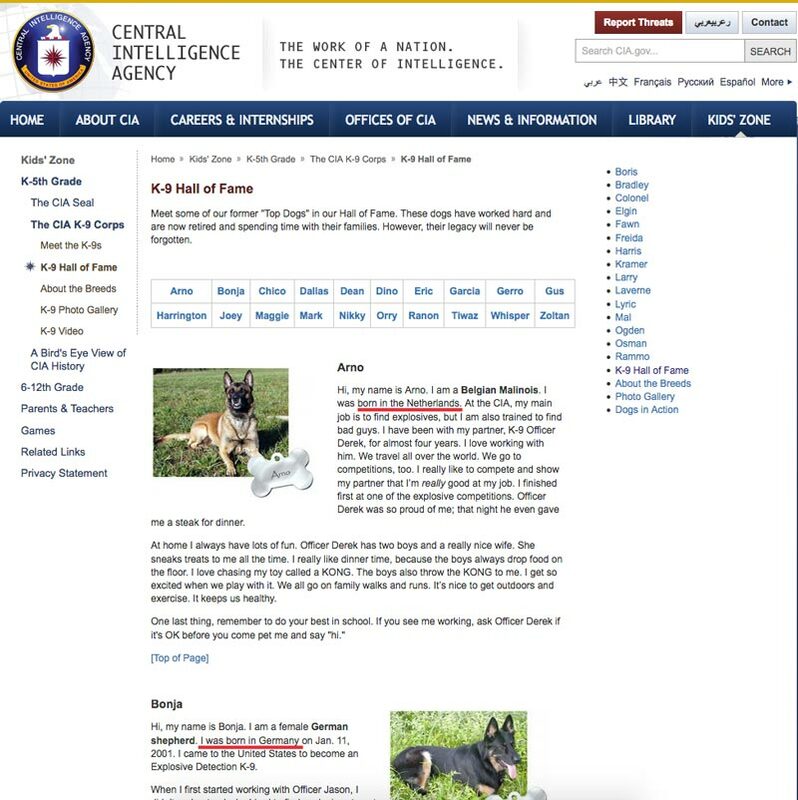 Take a look at the K-9 unit listed on the CIA website. 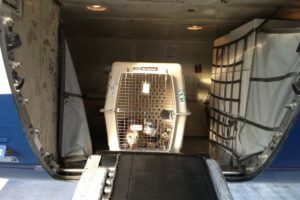 AKC, what have you done to working breeds, that US law enforcement and intelligent agencies forced to import K-9s from Europe? Can you imagine US law enforcement drive German cars instead of Ford and GMC? I’ve met many doberman breeders in the US, who deeply care for the breed. And while they acknowledge the pros and cons of both types, they have to breed dogs that would do well in AKC, not FCI. After all, pet owners want to buy puppies from Champions. This drives the breeding choices. While I wanted to focus this article on generalized difference between American vs European dobermans, there are AKC breeders in the US that try to bring back working ability to the AKC show dobermans. And there are some European Doberman breeders that breed a slimmer type of doberman that might be able to show at AKC. I’ve heard some people have done it. But in general, most of European Dobermans won’t be competitive at AKC shows. So, if you are interested in showing your dog at AKC – reach out to AKC breeders for an American Doberman type. I prefer European Doberman as that’s the dog I grew up with and know. American type has its own audience. Not everyone needs a Doberman to compete in Schutzhund, work in police, and with overall strong drive. American Dobermans are great family companions and definitely captivated an audience. American Doberman breeders seems to be more focused on health tests. While US breeders show off health certificates to a potential buyer, European breeders show off show and working titles. Health tests are more available (promoted and affordable) in the US, than in Europe (read about Doberman genetic diseases). But the breeding pool is a lot smaller in the US than in Europe, so being health conscience seems a sharper necessity. Half of the breeders I’ve contacted in Europe in 2014 didn’t have as many health tests done to their dogs comparing to US breeders. Read my article about how to find a breeder in Europe. I can see it is changing every year and European breeders rely more and more on the health tests when making breeding choices. One breeder said “a European doberman is too much of a dog to handle for an average person”. And I agree with that. I’d like to promote the original Doberman breed, but American type is obviously a supply for a demand. Dobermans are good looking dogs, and American doberman type makes it more available to an average pet owner, which promotes the breed overall. And contribution of each conscience breeder (either in the US or in Europe) is priceless for the future of this magnificent breed. if you prefer powerful look and stable temperament of the European Doberman. With a European Doberman you most likely won’t be able to participate in competitive conformation shows (in the US), but your dog will excel in any other activities and dog sports. The European Doberman community doesn’t really have a supportive organization to help you with your dog, but when you meet other European Doberman owners – you make friends. Most AKC breeders and Doberman communities won’t approve your choice and make you feel an outsider with your European dog. European breeders won’t say anything negative about American Doberman type. Most likely you won’t be able to return the dog to the breeder, in case you can no longer keep the dog. Think twice before committing to this choice. With an American Doberman you will be able to participate in AKC shows, which is a fun activity for the entire family. There is also agility and some AKC obedience competitions, that American dobermans do well. You will be a part of a large and very supportive community. US breeders don’t speak well about European Doberman and often consider European breeders crooks. If something goes wrong and you can’t keep the dog – most likely your breeder will take the dog back. Unless you have a very strong reason to own a European Doberman, I believe an American Doberman is a good choice for a pet. 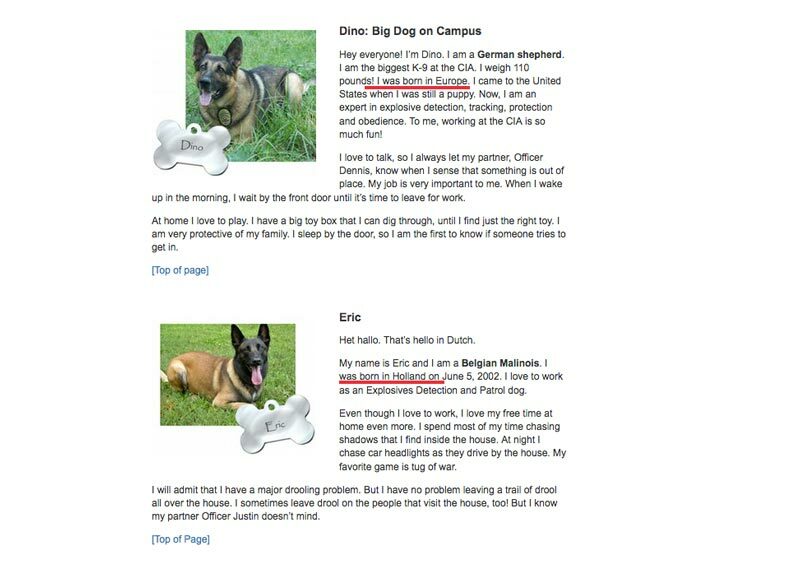 If you are researching Doberman breed, you must read Doberman genetic diseases. If you are still on the fence American vs European, read A day in the life with a European Doberman. If you already imported a puppy, you might find this helpful How to raise a doberman puppy – first days at home. 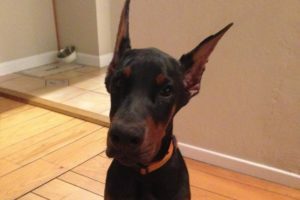 If you are a US reader, you might be interested to read Should I spay/neuter my European Doberman?